Are you running low on disk space? Try running a cleanup scan in Smart Disk Cleanup and find out how much junk is cluttering your PC. Smart Disk Cleanup safely identifies and cleans all the unnecessary files which have built up on your PC over time. You could possibly reclaim GBs of disk space in just minutes! Download and try Smart Disk Cleanup today. Getting a message that your computer is running low of disk space can be alarming, especially if you’re in the middle of an important project. Rather than rushing out to buy a new computer or additional storage first try running a scan with Smart Disk Cleanup. 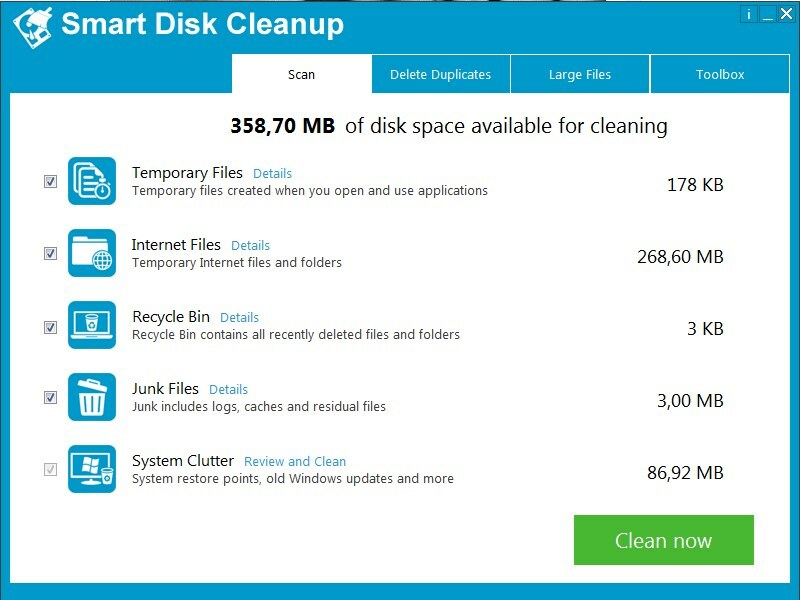 Smart Disk Cleanup targets unnecessary junk items taking up space on your PC. Temporary files are created when you open and use applications. These files are unnecessary and can be safely removed. While you surf the Internet your browser collects information about the sites you visited. This information includes elements of webpages, images, videos and audio files. The purpose of storing the information is to make it faster for your browser to load these sites the next time you visit. Correctly identifying and cleaning these unnecessary internet files can free up significant amounts of disk space. When you delete a file or folder Windows places it in the recycle bin. Items in the recycle bin are still taking up disk space until the recycle bin is emptied. 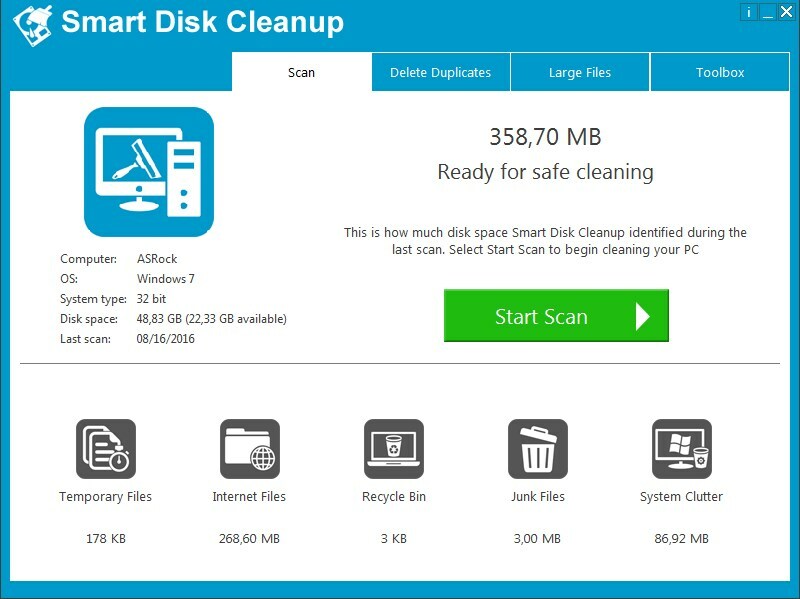 Smart Disk Cleanup checks the recycle bin as part of every cleaning scan. Any items found in the recycle bin are cleaned and disk space restored. Junk files include logs of recently opened documents and document searches, old driver cache files and residual files. Smart Disk Cleanup knows exactly where to look and safely identifies and cleans these junk files in just seconds. Our developers have spent hundreds of hours figuring out which system files are safe to clean. Removing old Windows updates, service packs, old restore points, Office cache files and more. Smart Disk Cleanup provides detailed information to help you determine which system files are safe to remove. Duplicate files, photos and videos can take up significant amounts of space. Searching through every file trying to identify duplicates stored in different folders is very time consuming. The Delete Duplicate feature immediately identifies duplicates which take up more than 1MB of disk space. You will even be able to preview any duplicate photos to ensure that you are removing only the duplicates you don’t need. A simple way to free up disk space is to identify and clean large files which you don’t need. Smart Disk Cleanup makes this easy. You can sort files based on size. Find all files greater than 1 MB or greater than 1GB in just seconds. Reclaim disk space by turning off hibernation mode on desktop PCs. Hibernation files can take up GBs of disk space. Disabling Hibernation mode immediately frees up this disk space. With Smart Disk Cleanup you can easily enable and disable hibernation when you need a boost in available disk space. Are there files, photos or videos on our PC which contain personal information and you want to securely delete? Shredding does not help you recover disk space but it does make files unrecoverable. Shredding overwrites the information in a file a number of times ensuring that even the most sophisticated data recover tools can’t recover these deleted files. Try Smart Disk Cleanup today! Smart Disk Cleanup is the simple solution for immediately cleaning disk space. Try our free scan now. Check your PC and see how much disk space can be safely recovered. Operating Systems: Windows XP, Windows Server 2003, Windows Vista 32-bit, Windows Vista 64-bit, Windows XP 64-bit, Windows 7 64-bit, Windows 2008 Server, Windows 2008 Server 64-bit, Windows 2003 Server 64-bit, Windows 7 32-bit, Windows 8 32-bit, Windows 8 64-bit, Windows 10 32-bit, Windows 10 64-bit.